The toes of these little girl's leather shoes are worn completely through. I think they may have had bows on the front at one time. Any guesses on how old these are? Oh my gosh! Old baby shoes now! They are beautiful paintings. I was really inspired by the old photographs you were painting as I was applying the same onto old bottles. I have to share with you that I have a collection of old baby shoes I started hoarding this past summer. Jack thinks I'm nuts. I'm not sure what I will do with them but there is something about those little shoes.... Well, I love you and I love your work. You are always inspiring me. beautiful and evocative painting - love it! I think this style of shoe is called Mary Janes. Amazing how a pair of old shoes can evoke so much emotion. Wonderful painting, Don. I've been saving a pair of my son's boots for 12 years. Keep meaning to paint them. I will, one of these cold winter days. Hi Mary, what a nice note--thanks! I've been wanting to paint shoes for a long time and it was so great to discover these old ones. That's great you have a collection. These children's shoes seem to me such a poignant reflection of the child who wore them, now grown old or more likely passed on. Send me some jpegs of your bottles, will you? Mary Jane was a character created by Richard Outcault for his comic strip, Buster Brown, which was first published in 1902. She was the sister of the title character, Buster Brown. In 1904, Outcault travelled to the St. Louis World's Fair and sold licenses to up to 200 companies to use the Buster Brown characters to advertise their products. Among them was the Brown Shoe Company, who later hired actors to tour the country, performing as the Buster Brown characters in theaters and stores. This strategy helped the Brown Shoe Company become the most prominently associated brand with the Buster Brown characters. The style of shoe Buster Brown and his sister wore came to be known by her name, Mary Jane. I just love the shoes! 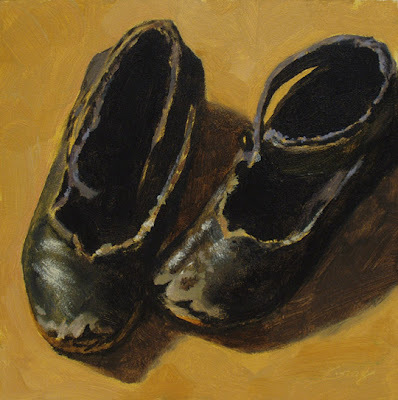 Painting shoes must be in because I just came from D. Prizzi's site and she did a painting of a purple pair of Prada's. Well, they make wonderful compositions...yours is just wonderful!!!! Hi Jean--thanks for the kind words! This shoe series is very special. So much character in each painting. Thanks, M--I really appreciate your thoughts. Thanks LC, for the visit and your comments--I really enjoy your work.